Home / Aquaman / DC Extended Universe / Jason Momoa / Superhero Movie / Warner Bros / Is 'Aquaman' DC's Best After The Dark Knight? The first reactions are out and they are mostly positive. Aquaman aka Arthur Curry is one of the oldest DC Comics characters created by Paul Norris and Mort Weisinger and also the founding member of the Justice League. His superhuman abilities include water manipulation, night vision, control over ice, super strength, flight, inhuman durability, sonar sense, jumping, heat resistance, super speed, storm control, teleportation, and superhuman healing. Aquaman can breathe underwater, communicate telepathically with sea life and has an impenetrable skin. He is the only superhero in the DC Universe who can actually defeat Superman. From comic books to the big screen, Aquaman is finally arriving with its solo venture and comic fans across the world are much hyped up especially because it’s directed by one of the visionary directors of our time – James Wan. From the teasers and trailers, the direction looks visually amazing. James Wan is known for making horror movies like Saw, Insidious and The Conjuring and blockbuster like Furious 7 is definitely giving Aquaman back his dignity. Often bullied for his ability to talk to fish, Director James Wan is actually trying to exploit this superpower in the best possible way. Aquaman has already broken Avengers: Infinity War’s advance booking record according to Fandango. Things are looking bright in the DC Extended Universe especially after the recent debacles. Aquaman is a solo movie hence it would be inappropriate to compare it with Marvel’s Avengers but the movie still looks exceptionally promising in terms of visual appeal and comic accuracy. Aquaman is Star Wars underwater and if everything goes as predicted, this epic adventure will give a new hope to the failing DC Extended Universe and Warner Bros. A war is coming to the surface. 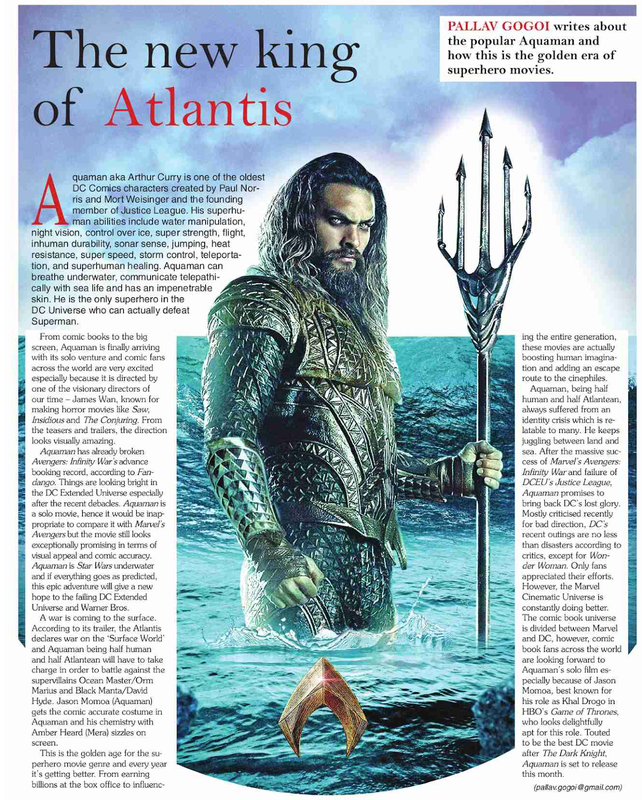 According to its trailer, the Atlantis declares war on the ‘Surface World’ and Aquaman being half human and half Atlantean will have to take charge in order to battle against the supervillains Ocean Master/Orm Marius and Black Manta/David Hyde. Jason Momoa (Aquaman) gets the comic accurate costume in Aquaman and his chemistry with Amber Heard (Mera) sizzles on screen. This is the golden age for the Superhero movie genre and every year it’s getting better. 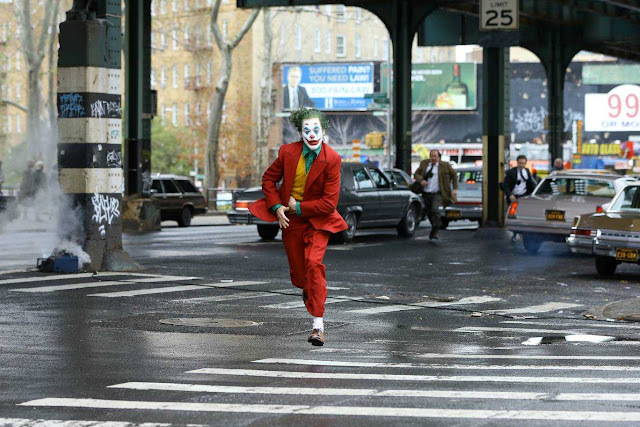 From earning billions at the box office to influencing the entire generation, these movies are actually boosting human imagination and adding an escape route to the cinephiles. Aquaman being half human and half Atlantean always suffered from an identity crisis which is relatable to many. He keeps juggling between the land and the sea. 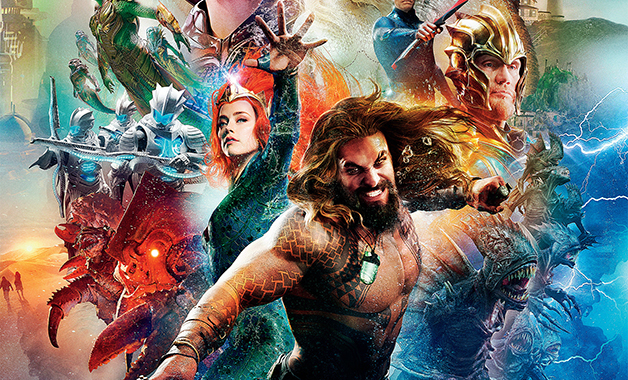 After the massive success of Marvel’s Avengers: Infinity War and failure of DCEU’s Justice League, Aquaman promises to bring back DC’s lost glory. Mostly criticized recently for bad direction DC’s recent outings are no less than disasters according to critics except Wonder Woman. Only fans appreciated their efforts however Marvel Cinematic Universe is constantly doing better. The comic book universe is divided between Marvel and DC, however; comic book fans across the world are much hyped up for Aquaman’s solo film especially because of Jason Momoa (best known for his role as Khal Drogo in HBO’s Game of Thrones) who looks delightfully apt for this role. Touted to be the best DC movie ever after The Dark Knight, Aquaman is set to release on 14th December 2018 in India, a week before the US.